You definitely won’t be wasting away if you choose to spend some pre- or post-cruise time at the Margaritaville Beach Resort in Hollywood Beach, Florida. 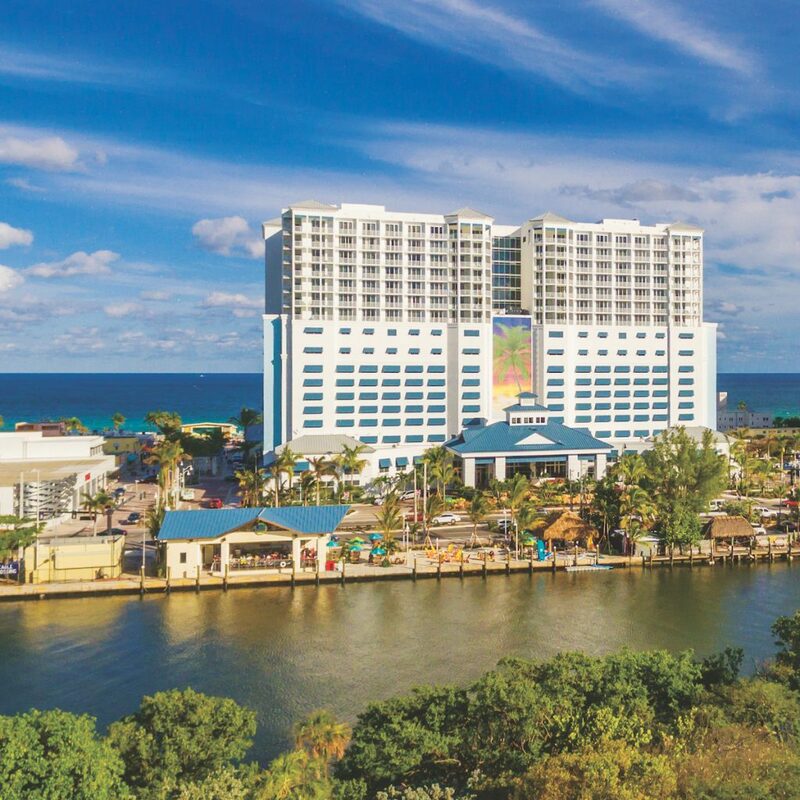 Less than 10 miles south of Port Everglades, the Jimmy Buffett–themed beachfront resort is the perfect place to wind up or gear down before or after your cruise. From the moment you enter the lobby, the laid-back island ambience surrounds you — from the 15-foot-tall shiny blue “Blown Out Flip Flop” pop-top-art sculpture to the whimsical lighting hanging over comfy rustic furniture. Start your stay at one of two pools – the Landshark Pool, which features the Landshark Bar and Grill, pool cabanas, and a waterslide set amid a lazy river–style pool, or the quieter Lone Palm Pool and its casual beachside bar. More relaxation can be found at the tropical, oceanfront St. Somewhere Spa, Fitness, and Salon or the adults-only License to Chill Bar on the 11th floor rooftop terrace — all while the kids are kept busy at the Parakeets Kid’s Club (ages 4-12). Spend some time on the beach, too, where you can relax under an umbrella or in a cabana; try out the Flowrider Double surfing simulator; or borrow a complimentary bike and cruise the Hollywood Oceanfront Broadwalk, a 2.2-mile-long pedestrian promenade bustling with outdoor cafés and shops. Also on the Broadwalk, right in front of the resort, is the city’s famous Hollywood Beach Bandshell, which features a scheduled lineup of local acts and live entertainment. When hunger strikes, head for — where else? — Jimmy Buffett’s Margaritaville for some Volcano Nachos and a Cheeseburger in Paradise washed down with a Who’s to Blame margarita. For an even more casual beachfront bite, head for the Floridays Airstream Café. Named after the 1986 album and song by Jimmy Buffett, the refurbished airstream trailer is parked directly on the Broadwalk and serves a quick-service menu of gourmet hot dogs, sausage, and brat inspired by Buffett’s travels. For something fancier, book a table at the upscale JWB Prime Steak and Seafood (named after James [Jimmy] William Buffett himself), which features a contemporary menu of fresh seasonal seafood, a raw bar, and prime steaks paired with world-class wines and handcrafted cocktails.